Williams lost to Urszula Radwanska of Poland. Venus Williams of the U.S. clenches her fist after winning the second set against Poland's Urszula Radwanska in their first round match of the French Open tennis tournament, at Roland Garros stadium in Paris, Sunday, May 26, 2013. 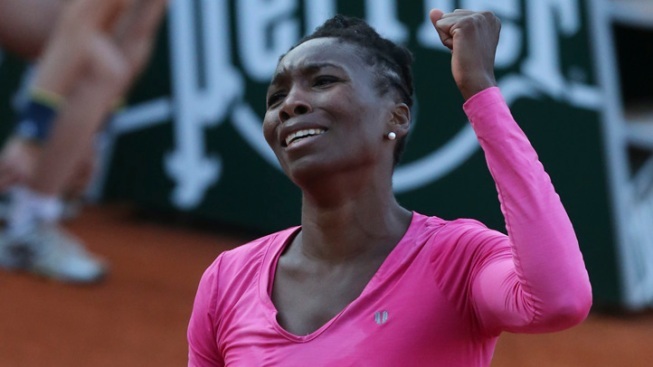 Grimacing after some poor shots, leaning over with hands on knees while catching her breath after others, Venus Williams left the French Open after the first round for the first time since 2001. Williams, a seven-time Grand Slam champion seeded 30th, lost 7-6 (5), 6-7 (4), 6-4 Sunday to 40th-ranked Urszula Radwanska of Poland, who never has been past the second round of a major tournament. The quick exit for the 32-year-old Williams came a year after her younger sister Serena was upset in the first round at Roland Garros. Radwanska also has a sister who plays professional tennis, Agnieszka, who beat Venus in the second round at the French Open last year. Venus Williams now has two first-round losses in the past four Grand Slam tournaments.